​No convenience fees - Save time later - buy online now. 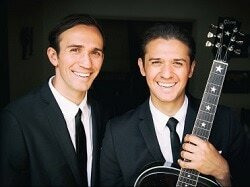 Real life brothers Dylan and Zachary Zmed and The Bird Dogs band bring a genuine and heartfelt Everly Brothers Experience to the stage in this exuberant concert celebrating the extraordinary harmonies created by Don and Phil Everly. When the guitar became electric, the Everly Brothers bridged the gap between Country and Rock 'n Roll. With so many hits and classics including "All I Have to Do is Dream," "Cathy's Clown," "Bye Bye Love," "Wake Up Little Susie," "Let It Be Me," "Til I Kissed Ya," "When Will I Be Loved," and "Bird Dog," the Everly Brothers inspired many artists to follow—The Beatles, Simon & Garfunkel (in particular), The Kinks and Buddy Holly, among many others.